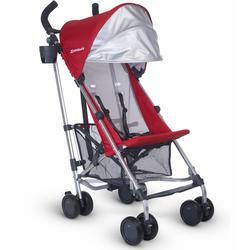 UPPAbaby G-Lite Strollers - 2019 Strollers - Free Shipping! 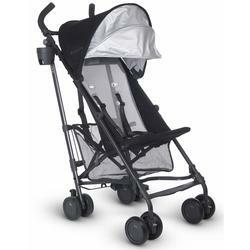 G-LiTE: Redefining the Lightweight Stroller. The name speaks for itself. The G-LiTE is so lightweight and portable that it will surely become your favorite ‘get around town’ accessory. Juggling kids, the groceries and your car keys? With a convenient carry strap you can pick up the G-LiTE with one hand. The name speaks for itself. The G-LiTE is so lightweight and portable that it will surely become your favorite ‘get around town’ accessory. Juggling kids, the groceries and your car keys? With a convenient carry strap you can pick up the G-LiTE with one hand. Our extendable pop-out sun canopy offers SPF 50+ protection for your child. G-LiTE’s seat pad can be easily removed for washing away your child’s spills. Updated for 2013, G-LiTE’s hand-level triggers make it easy to fold it with just your fingers. Once folded, G-LiTE stands on its own and out of the way. In a perfect world spills and stains wouldnt be synonymous with children. Until then we understand that messes happen. Our replacement seat pad is great for those times when your seat pad is in the wash or you need to freshen up your stroller seat.